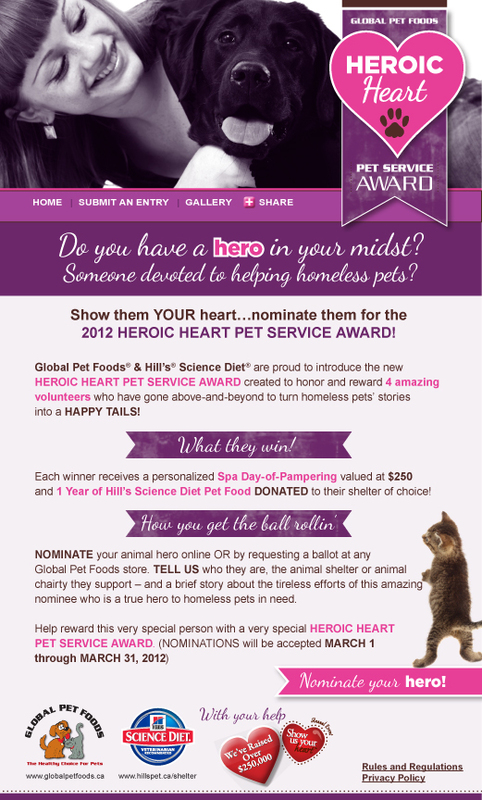 From March 1 – 31, Global Pet Foods & Hill’s Science Diet are inviting Canadians to nominate outstanding animal shelter and rescue volunteers for the first Heroic Heart Pet Service Award! We’d like to invite Toronto Pet Daily readers to nominate a pet hero by filling out a ballot and sharing a brief story (250 words or less) on how the nominee has demonstrated outstanding care and compassion to homeless pets. Nominations can be made at your local Global Pet Foods store or online through Facebook.com/GlobalPetFoods starting tomorrow! of Canada: Western Canada, Ontario, Quebec and Atlantic Canada. Heroic Heart award winners will receive a much deserved relaxing spa day and a one year supply of Hill’s Science Diet Pet Food, which will be donated to their shelter of choice.